It looks like it was copied from Baldi's Basics. But can be not, So you guys can shut up? This is a game inspired by Baldi's Basics, which is nice, because there are a few changes, so it won't be a direct copy. It was inspired by it and innovates the genre of game, check your privilege child. memix - innovates how? by looking slightly above Baldi's intentionally bad graphics? By using the same idea of a horror-themed MATH game? An educational game that has nothing to do with actual learning? GASP! and for god's sake, don't call this a genre, unless that genre is trash. This is definitely what Baldi should've been! Big thanks to the Dev you're awesome dude! Some things do need to be fixed and changed but for the most part its perfect! Everyone should give this game a try! This game was a WILD ride. It took me a few days to complete it and of course, by time I finish it, you already updated the game. I really appreciate difficult games like this one and winning the challenge feels WAY more rewarding than any other type of game. You did phenomenal creating this and like I said in my last review, I can definitely see this as a standalone game, not just a fan-game. I went so far as to create a map for this version and used it to complete it. I've played the newest update since recording this and I've ran into a few bugs including the janitor pinning me in a corner by Mr. Mix's room and the 'Mistress?' not noticing that I'm running in the halls sometimes. I'm super excited to explore the new build and find more secrets. Phenomenal game. I'm ecstatic that you're adding onto it and I can't wait for future updates. PS: I want a list of the character's names (including the old lady with the scythe that we almost never see) - I'm SUPER curious. Thanks again for making this! Thank You for these videos, also cool what You drawn a map of level! but it lacks of zone behind the kitchen windows, they are important. In alpha 0.0.3 Mr.Cleany-Clean should not stuck in corners, but if him stuck just throw trash near him, and he will grab it and unstuck. And i thinking on names. It never felt soooooo good to be back in the classroom, that is until I realised my teacher was wielding an axe. This incarnation of Advanced Education really pushes the scare factor, right in your wide eyed face. Seriously. If you've played Baldi or if you haven't Victor Strobovski's school for scared mutants is well worth a play through. For some reason, I cannot run this game on my computer. I had no problem with Baldi's, but this games makes it lock up as if it were a virus. It's not my antivirus software either. Anyone have a fix for this? This game is advanced in everyway than Baldi's. Whether it be the characters in this game, maths, jumpscares, visuals, items, weirdness, almost everything is ADVANCED! wanna be friends? cause im wearing headphones likes those ones with the microphone! is it a horror game? Wasn't easy, but managed to complete the game. Game is A LOT more luck based than Baldi's Basics, but not insuperable in any way. There is a green checked solution that has a possible answer. After 5 days and hundrends of hours I managed to beat the game! I enjoyed every single minute playing this game! this is a fantastic horror game in it's own right! Is an amazing fan game, and incredibly difficult. thank you so much for sharing your art! How do I fix it? I tried recopying the files from the zip folder to the current unzipped folder but it still doesn't work. I do have windows if you are asking and the game download link has a windows icon next to it. This is the crash log I found in the STROBOVSKY folder. Hope the developer can help me fix the problem. LogInit: Display: Attempting to find via project info helper. LogTaskGraph: Started task graph with 5 named threads and 14 total threads with 3 sets of task threads. [2018.06.15-17.00.25:058][ 0]LogInit: Using OS detected language (en-US). [2018.06.15-17.00.25:058][ 0]LogInit: Using OS detected locale (en-US). [2018.06.15-17.00.25:059][ 0]LogTextLocalizationManager: No specific localization for 'en-US' exists, so the 'en' localization will be used. I download the missing dll files and put them in the correct system folder but I still get the same crash log error. I think the problem is with how unreal engine is interacting with my computer. I'm not saying the problem is with your game but the unreal engine itself. Other people are having the same problems as me across the internet from other unreal engine related topics. This was the best scariest horror fan game I have ever played too bad I am not really good at order of operations lol. That's Great Quality Game! I Really Enjoyed Fun! I want to say one more time that it is REALLY kind of mrdrnose putting my name on the menu. I love playing this game so much, so seeing my name made me extremely happy. Mrdrnose gave us what I exactly expected. A complete horrifying meta experience that give you more and more each time you play. The new characters, the updated A.I., new sounds etc just add up to what it was already something great. As I said before I personally consider this game better and more mature than Baldi's Basics. It feels like the complete package, especially with 0.0.2a update. It's big, scary, unpredictable and highly addicting. Once more congrats on the game and thank you for the mention, it means a lot! That actually gave me a few spoopy reactions! After I knew that Viktor can move when you are in a problem actually terrified me as well! Which made me mess up a lot on problems! As well as the horrifying sounds in the background and picture changing really got to me as well! This is a fan game done right! This game was super aesthetically pleasing and VERY difficult compared to Baldi's Basics. The music was amazing and I absolutely loved the change in mood after the first notebook. The ambiance was genuinely frightening and there were MANY creepypasta references throughout the game that I haven't seen in a long time. I absolutely LOVE that you put Mr. Mix in this game. I know I barely scratched the surface of this but I thoroughly enjoyed it and it has excellent replayability. I know it's a Baldi's Basics fan game, but I can definitely see this as a standalone game on its own. It's completely and totally different in so many ways, like an 'adult' version of Baldi. Thanks so much for making this! I'm sure I'll end up diving back into it soon. THE BEST BALDI's BASIC FANMADE GAME!!!! I'm glad my drawing of the full body of Mr. Mix made it in the game! 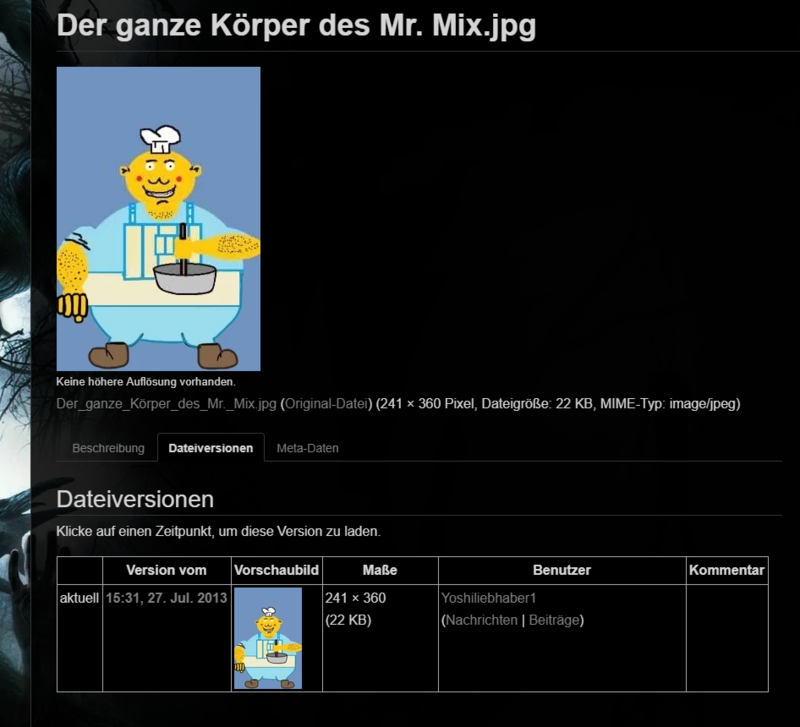 (Look it up at 'Deutsches Creepypasta Wiki') I couldn't believe my eyes when i saw it :D ! I think i drew his lower body back in 2011/12 or so... Anyways, nice game!! Personaly I find your game a more complete Baldi's Basics! The personality and the atmosphere of the game is certainly eerie and dark. You suspect that something is off, since the game is following the Baldi's Basics style. But when the girl with the headset puts you into the tomato soup pot to cook(presumably it is that, could definitely be blood :P ) you realize things are much more serious and dark than a teacher with a nasty looking axe. Visually the game has a weird aesthetic that I really like. I find the mixed elements (sci-fi doors, house decoration, cute pictures etc) pretty interesting. They add a lot to the atmosphere. Gameplay wise, while it is more linear than Baldi's basics, it remains challenging! This was something I wanted to see in a game like that. Good call on making it like that in my opinion. I couldn't finish the game though. Some doors didn't open sometimes. Is it a bug or it is intended to be like that? Also after the 8-9th notebook things got really vague. I kinda got lost. Overall I really enjoyed the game!! I hope we will see some updates, because this has a lot of potential! Good luck with this and any other projects! In my opinion, the best Baldi's Basics inspired game. The graphics remind me a lot of The Mask Reveals Disgusting Face and how I'm limited in time to answer the math problems builds more anxiety than the think pad. Most definitely looking forward to an update!